In the U.K.? If you are, and you haven’t seen Secret Cinema Presents Star Wars: The Empire Strikes Back, you still have time to make the show! 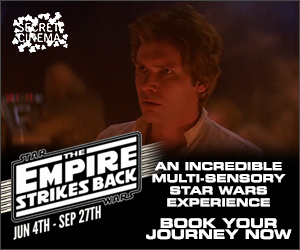 Be sure to get your tickets for Secret Cinema Presents Star Wars: The Empire Strikes Back now at http://www.secretcinema.org/tickets! Thank you to Alex and Keir for the images and videos. Next article Star Wars Rebels: The Clones Return in Season 2! Previous article Jedi, Germany, and Stormtrooping for Charity with Marcus Dohring on Bantha Banter!